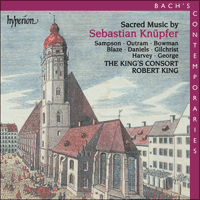 Sebastian Knüpfer is yet another Baroque composer whose reputation and popularity have been overshadowed by J S Bach. Little of Knüpfer's music has previously been transcribed from its many manuscripts, let alone published. However, in his day Knüpfer was a respected and highly sought-after composer; his compositions were admired by his contemporaries and, according to his obituary, he 'composed quotations of the Psalms and other Biblical books with such sweetness and skilfulness that he delighted even the saddest hearts, and his name is spoken with admiration not only in Leipzig but also outside'. As we have come to expect from Robert King and his King's Consort, the performances are of the highest standard with some of the finest singers on the early music platform today. Throughout the seventeenth and eighteenth centuries the position of the Thomaskantor in Leipzig (organist and choirmaster of the Thomaskirche) was one of the most respected and important musical posts in central Germany. An unbroken chain of fine musicians, appointed by the City Council but whose fame in their time stretched far beyond the boundaries of Leipzig, reaches from Seth Calvisius to Johann Hermann Schein, Tobias Michael, Sebastian Knüpfer, Johann Schelle and Johann Kuhnau up to Johann Sebastian Bach. Simply by looking at the legacy of these composers one can draw a representative picture of the Baroque music world in central Germany. Unfortunately, however, with the exception of Schein and Bach their fame did not survive as their works have been decimated over the years, and most of the few surviving pieces have not been reconstructed in new editions. The high standard of seventeenth-century sacred music in Leipzig is perhaps best illuminated by Sebastian Knüpfer’s compositions. Born in 1633 in Asch, Vogtland, the son of a cantor, Knüpfer received his first musical education from his father. At the age of thirteen he was accepted at the renowned Gymnasium Poeticum in Regensburg, where he remained for eight years. In Regensburg, Knüpfer was highly active in musical circles, but was also known for his profound knowledge of philology and poetry. After finishing his schooling he went to Leipzig, probably to study there; strangely, though, his name does not appear on the matriculation register. From this period we have evidence only of his non-compositional activities: he sang as concertist in performances of the Thomaskantor Tobias Michael and additionally taught music. The musical qualities of the young Knüpfer must soon have been noticed in Leipzig for, after the death of Tobias Michael in June 1657, he was appointed Thomaskantor at the age of only twenty-four. Appointing Knüpfer was a wise decision: thanks to his commitment, Leipzig’s sacred music enjoyed a splendour and magnificence that was formerly unknown. Handwritten copies of Knüpfer’s sacred works circulated throughout the entire German-speaking area and became desirable collectors’ items, thereby spreading the fame of the composer and his post. After nineteen years of fruitful work, he died on 10 October 1676 at the age of forty-three. Knüpfer’s contemporaries admired him for his great erudition, which is also demonstrated in his expressive compositions. According to his obituary, he ‘composed quotations of the Psalms and other Biblical books with such sweetness and skilfulness that he delighted even the saddest hearts, and his name is spoken with admiration not only in Leipzig but also outside’. When one looks at the scores of Knüpfer’s vocal works, it becomes evident that this tribute is not made of empty words. The compositions present an exceptionally high degree of compositional elaboration, musical inventiveness and sensitive text interpretation. Furthermore, many of Knüpfer’s works possess a certain dignity and grandezza which make their creator—from a modern point of view—one of the greatest composers of his time. They belong, in the words of the music historian Alfred Einstein, to those apparently fossilized musical monuments that merely require a magician and his magic spell in order to burst back into life. The Christmas concerto Vom Himmel hoch, da komm ich her (‘From heaven on high I come here’) is one of Knüpfer’s late works, as are probably all his grandly scored sacred concertos. On the copy, which is unique in the Grimma collection, is written the date 1673, which is probably when it was composed. The composition is textually based on a free combination of chorale lines and Biblical quotations, and arranged as a dialogue between the choir of the angels, set for three sopranos and three violins, and the choir of the shepherds, scored for three lower vocal and three instrumental parts. The two choirs unite towards the end of the work in a concluding chorus, praising God. Knüpfer symbolizes the otherworldly quality and unfathomable beauty of the angelic song by a rigorous canon set to the words ‘Ehre sei Gott in der Höhe’ (‘Glory to God in the highest’). The chorale cantata Was mein Gott will, das gescheh allzeit (‘What my God wishes, shall be always’) is one of Knüpfer’s most elaborate works. Of the four verses, based on a song, the outer ones are musically closely related to each other and scored for the full ensemble, whereas in the middle verses the vocal parts are reduced from six to three. In the outer movements the chorale melody appears as a cantus fìrmus with imitative features, containing some complex canonic settings; in the middle movements, however, the chorale is treated more freely and with greater variation. One of the most mysterious works ascribed to Knüpfer is the chorale cantata Wenn mein Stündlein vorhanden ist (‘When my hour has come to leave’). In its musical substance, the piece is based upon a dialogue cantata by Johann Rosenmüller; however, with the exception of the introductory sinfonia and the concluding chorale, this was drastically changed in its formal character and structure. Should the present arrangement really be Knüpfer’s—the records in the Grimma collection leave few doubts about this—it is a precious proof for Knüpfer’s acquisition of the famous, harmonically rich, sonorous and even sensuous compositional style developed by Rosenmüller, which introduced a new era to the central German music of the middle of the seventeenth century. The monumental and solemn idiom which is characteristic of Knüpfer appears clearly in the grandly scored Psalm-setting Ach Herr, strafe mich nicht in deinem Zorn (‘O Lord, rebuke me not in thine anger’). The effect of this work is not solely due to the combination of great structural skilfulness and refined, elaborate instrumentation, but also to the deliberate crossing of traditional genre boundaries. For this piece, which probably originates from the period 1670 to 1675, Knüpfer chooses the key of C minor, a most unusual tonality for that time. In addition he utilizes (alongside the obligatory five-part string ensemble) trumpets and timpani, instruments that are hardly ever heard in this key. The unusual sound quality is also due to the two ‘flutes’, although it is not absolutely clear exactly what instruments Knüpfer intended. A copy of the score in Berlin marks the parts as ‘Traversi’ flutes; however, the tessitura of the parts would result in unsolvable performance difficulties. Another copy in Dresden asks for ‘Flauti’ (recorders) and this recording follows that instruction. In the context of this composition, the symbolism of these instruments is strangely altered, almost distorted. The sound of the recorders does not stand (as it usually does) for gentleness and sweetness but symbolizes quiet humility and painful agony, and the trumpets and timpani demonstrate not God’s glory and splendour but instead portray his raging wrath and cruel mercilessness, only moderating in the unexpected, conciliatory concluding C major cadence. Quemadmodum desiderat cervus (‘Like as the hart desireth’), set for solo bass and a small string group, stylistically belongs to an earlier period. It probably originates from the beginning of Knüpfer’s career in Leipzig; it perhaps belongs to a collection of sacred music which was to be printed in 1663, but apparently was eventually not published. The Italian influence, notably that of Giacomo Carissimi, is evident, especially in the flowing theme of the concluding triple-time movement. A similarly dense and expressive work such as Ach Herr, strafe mich nicht in deinem Zorn is Knüpfer’s setting of Psalm 137, Super flumina Babylonis (‘By the waters of Babylon’). The gloomy text receives its great intensity from the two cornetts and three sackbuts which accompany the four-part vocal ensemble. A distinctive feature is that these wind instruments play only in the tutti sections, whereas the inner verses (performed largely by soloists) as well as the short ritornelli are played only by the five-part string ensemble. The melancholy atmosphere of the opening grows to a relentless rage and cursing of Babylon in the concluding fugato. The chorale cantata Jesus Christus, unser Heiland (‘Jesus Christ, our saviour’) is set for five voices and five instruments, and is based on a poetic work by Martin Luther. The melody, however, originates from the pre-Reformation period. Knüpfer combines the three verses of the text with an elaborately symmetrical musical structure. The two outer movements are scored for the full ensemble, treating the chorale melody imitatively; the third verse is a variant of the first, transformed into triple time. The concerto-like, freer middle verse is framed by a dance-like ritornello. The Whitsun concerto Die Turteltaube lässt sich hören (‘The voice of the turtle dove is heard’) was written for a performance in May 1676, a few months before the death of the composer. Despite the enormous scoring, including four trumpets, the composition presents a particularly sweet mood which demonstrates Knüpfer’s great ability to incorporate stylistic elements of Rosenmüller and various Italian composers without giving up his own monumental style. The text of the work is a dialogue, drawn from different passages of the Bible, and is mostly scored for soloists. In this way the composer skilfully saves the full splendour of the tutti for the concluding hymn of praise to the Holy Trinity. Au cours des XVIIe et XVIIIe siècles, le poste de cantor de l’église Saint-Thomas de Leipzig fut l’une des charges les plus renommées et importantes d’Allemagne centrale. La suite ininterrompue d’artistes remarquables qui se virent confier ce poste par le Conseil municipal et dont la renommée, à l’époque, s’étendait bien au-delà des limites de Leipzig, va de Seth Calvisius à Johann Sebastian Bach en passant par Johann Hermann Schein, Tobias Michael, Sebastian Knüpfer, Johann Schelle et Johann Kuhnau. Rien qu’en jetant un coup d’œil sur l’héritage artistique de ces compositeurs, on peut se faire une image représentative de la scène musicale de l’Allemagne centrale à l’époque baroque. Malheureusement, à l’exception de Schein et de Bach, peu de choses ont subsisté de la renommée d’antan, car l’ensemble des œuvres a été considérablement décimé au cours du temps et peu d’œuvres préservées ont été rééditées jusqu’à ce jour. Ce sont probablement les compositions de Sebastian Knüpfer qui précisent au mieux le niveau élevé de la musique religieuse de Leipzig au XVIIe siècle. Knüpfer est né en 1633 dans la circonscription du bailli de Asch. Son père, qui était cantor, assura son initiation musicale. À l’âge de treize ans, il fut reçu au fameux collège Poeticum de Ratisbonne, où il resta huit ans. À Ratisbonne, Knüpfer déploya une activité musicale intense, tout en se faisant également connaître pour ses profondes connaissances philologiques et poétiques. À la fin de sa scolarité, il se rendit à Leipzig afin d’y poursuivre ses études. Bien curieusement, son nom n’apparaît cependant pas sur les registres de l’université. De cette période, nous n’avons de preuves que de ses activités non liées à la composition: il chanta en tant que concertist lors des représentations de Tobias Michael, cantor de l’église Saint-Thomas, et enseigna également la musique. À Leipzig, on remarqua probablement très tôt les qualités musicales du jeune Knüpfer, car à la mort de Tobias Michael en juin 1657, le jeune homme à peine âgé de vingt-quatre ans fut désigné comme son successeur. La nomination de Knüpfer au poste de cantor de l’église Saint-Thomas se révéla être une sage décision: grâce à son engagement, la musique sacrée de Leipzig connut une magnificence et une grandeur inconnue jusque-là. Les œuvres religieuses de Knüpfer, qui existaient uniquement sous la forme de manuscrits, devinrent des pièces de collection appréciées dans toute les régions de langue allemande et répandirent ainsi la renommée du compositeur et de sa fonction. Après dix-neuf années fructueuses, il mourut le 10 octobre 1676, à peine âgé de quarante-trois ans. Les contemporains de Knüpfer appréciaient surtout sa grande érudition, qui se manifestait également dans ses compositions éloquentes. Dans son oraison funèbre, on peut lire qu’«il a mis en musique des versets du Livre des Psaumes et d’autres Livres de la Bible avec tellement de douceur et une telle habilité, qu'il réussissait à consoler les cœurs les plus tristes et que son nom est cité avec admiration non seulement à Leipzig, mais bien au-delà». Un coup d’œil sur les partitions des œuvres vocales de Knüpfer suffit à démontrer le bien-fondé de cette assertion. Les compositions reflètent effectivement une élaboration hors du commun, une inventivité musicale et une grande capacité d’expression du texte. Nombreuses sont les œuvres de Knüpfer qui se caractérisent par une noblesse et une fière allure, qui aujourd’hui encore font de leur créateur l’un des compositeurs les plus grandioses de son temps. Comme le déclare Alfred Einstein, historien musical, ses œuvres appartiennent à ces monuments musicaux qui donnent l’impression d’être pétrifiés et qui n’attendent qu’un mot magique du maître pour ressusciter. Le concerto de Noël Vom Himmel hoch, da komm ich her («Je viens de tout en haut du ciel») appartient, comme probablement tous les concertos sacrés grandiosement écrits de Knüpfer, aux œuvres tardives du compositeur. La source rare qui se trouve dans la collection de Grimma mentionne la date de l’an 1673, qui doit vraisemblablement être considérée comme celle de sa création. La composition se base textuellement sur une combinaison libre de lignes cantiques et de textes de versets. Elle est conçue comme un dialogue entre le chœur des anges, composé de trois sopranos et de trois violons, et le chœur des bergers, composé de manière analogue de trois voix de chants et d’instruments graves. Les deux niveaux s’unissent à la fin de l’œuvre en un chant de remerciement final. Knüpfer symbolise la qualité supranaturelle et la beauté impénétrable du chant des anges par un canon rigoureux sur les paroles «Ehre sei Gott in der Höhe» («Loué soit Dieu là-haut»). La cantate basée sur le choral Was mein Gott will, das gescheh allzeit («Ce que mon Dieu veut se réalise toujours») appartient aux œuvres les plus élaborées de Knüpfer. Sur les quatre strophes, basées sur un chant, celles aux extrêmes sont étroitement liées l’une à l’autre musicalement et sont écrites pour tout l’ensemble tandis que les strophes centrales voient le nombre de leurs voix se réduire de six à trois voix. Dans les strophes extrêmes, la mélodie du choral apparaît comme un cantus firmus traité à la façon d’une imitation contenant quelques parties en canon complexes. Dans les parties centrales, au contraire, le choral est traité pluis librement et il contient davantage de variations. L’une des œuvres les plus énigmatiques transmises sous le nom de Knüpfer est la cantate basée sur le choral Wenn mein Stündlein vorhanden ist («Lorsque mon heure est arrivée»). Dans sa substance musicale, le morceau repose fortement sur un dialogue de cantate de Johann Rosenmüller, qui a cependant été fortement modifié dans son caractère formel et dans sa structure (à l’exception de l’ouverture et du choral conclusif). Si l’adaptation dont nous disposons est vraiment de Knüpfer (et la transmission dans la collection Grimma ne laisse aucun doute à ce sujet), elle constitue une preuve précieuse de l’assimilation du style de composition réputé développé par Rosenmüller. Style riche en harmonie, extrêmement sonore et tout simplement sensoriel, qui introduisit une nouvelle période dans la musique de l’Allemagne centrale du milieu du XVIIe siècle. La monumentalité et la supériorité caractéristiques des paroles musicales de Knüpfer apparaissent clairement dans l’adaptation musicale de grande envergure du Psaume Ach Herr, strafe mich nicht in deinem Zorn («Éternel, ne me punis pas dans ta colère»). L’effet de cette œuvre ne repose pas uniquement sur la combinaison d’une grande adresse dans la composition et sur un art de l’instrumentation raffiné, mais également sur la transgression consciente des limites traditionnelles des genres. Ainsi, pour ce morceau probablement créé dans les années 1670 à 1675, Knüpfer choisit la clé de do mineur qui est une tonalité inhabituelle pour cette époque. En plus de l’ensemble à cordes et à cinq voix obligatoire, il fait appel à des instruments (les trompettes et les timbales) que l’on n’a pas l’habitude d’entendre jouer dans cette tonalité. La qualité de son inhabituelle de cette œuvre est également déterminée par les deux «flûtes»; mais il n’est pas tout à fait clair de quels instruments il s’agit. Une copie de la partition qui se trouve à Berlin décrit ces parties comme «Traversi», mais son exécution soulève des difficultés quasiment insolvables. Un mouvement vocal conservé à Dresde exige par contre la présence de «Flauti» (c.-à-d. des flûtes à bec), et cette consigne est respectée dans le présent enregistrement. Dans le contexte de la composition, la symbolique de ces instruments est interprétée de façon tout à fait différente, si pas presque déformée: dans cette œuvre, le son des flûtes n’est pas (comme d’habitude) synonyme de douceur et de grâce, mais symbolise l’humilité silencieuse et le deuil douloureux. Les trompettes et les timbales ne traduisent pas la splendeur et la magnificence de Dieu, mais décrivent plutôt son courroux tempétueux et son atroce cruauté, qui ne s’apaisent que dans la cadence finale de l’œuvre, dans un do majeur réconciliant inattendu. Quemadmodum desiderat cervus est uniquement prévu pour une basse et un petit groupe d’instruments à cordes et il appartient du point de vue stylistique à une période antérieure. Il date probablement déjà du début du mandat de Knüpfer à Leipzig et fit sans doute partie d’un recueil de concertos de musique sacrée rassemblé en 1663 en vue d’être édité, mais qui en fin de compte semble ne pas avoir été publié. L’influence italienne, notamment celle de Giacomo Carissimi, est évidente, particulièrement dans la fluidité thématique du mouvement à trois temps conclusif. L’adaptation musicale du Psaume 137 Super flumina Babylonis par Knüpfer est une œuvre travaillée de façon aussi dense et expressive que Ach Herr, strafe mich nicht in deinem Zorn. Le texte lugubre doit sa forte intensité aux deux cornets à bouquin et aux trois sacqueboutes qui accompagnent l’ensemble à quatre voix. Une caractéristique déterminante de la création sonore est constituée par le fait que les joueurs des instruments à vent n’interviennent que dans les tuttis, alors que les strophes intérieures, exécutées par les solistes, ainsi que les courtes ritournelles ne sont réservées qu’au groupe des cinq instruments à cordes. L’atmosphère mélancolique du début s’intensifie ensuite avec la malédiction de Babylone en fugato jusqu’à l’inexorable courroux. La cantate sur le choral Jesus Christus, unser Heiland («Jésus-Christ, notre sauveur») à cinq voix et à cinq instruments, se base sur un poème de Martin Luther, tandis que la mélodie qui l’accompagne est issue de la période d’avant la Réforme. Ici, Knüpfer combine la disposition en trois strophes de son texte à une structure musicale créée, avec art, de façon symétrique. Les deux mouvements aux extrêmes sont écrits pour tout l’ensemble et traitent la mélodie du choral en imitation; la troisième strophe étant ainsi une variante de la première transformée en trois temps. La strophe médiane, magistralement assouplie, est encadrée par une ritournelle dansante. Le concerto de Pentecôte Die Turteltaube lässt sich hören («La tourterelle se fait entendre») fut créé pour une représentation en mai 1676, c’est-à-dire quelques mois à peine avant la mort du compositeur. Il appartient ainsi à ses dernières œuvres. L’atmosphère particulièrement gracieuse de la composition, malgré une distribution impressionnante incluant quatre trompettes, démontre la grande capacité qu’a Knüpfer d’incorporer les éléments stylistiques de Rosenmüller et de divers compositeurs italiens sans toutefois abandonner son propre style monumental. Le texte de l’œuvre prend la forme d’un dialogue provenant de différents passages de la Bible et est principalement composé pour les solistes. De cette façon, le compositeur garde habilement la pleine magnificence du tutti pour la glorification finale de la Sainte Trinité. Das Leipziger Thomaskantorat war während des gesamten 17. und 18. Jahrhunderts eines der angesehensten und bedeutendsten musikalischen Ämter Mitteldeutschlands. Von Seth Calvisius über Johann Hermann Schein, Tobias Michael, Sebastian Knüpfer, Johann Schelle und Johann Kuhnau bis zu Johann Sebastian Bach reicht die ungebrochene Kette vorzüglicher und in ihrer Zeit weit über die Grenzen Leipzigs hinaus bekannter Künstler, denen der Rat der Stadt die Führung dieses Amtes anvertraute. Schon allein aus der Betrachtung des künstlerischen Vermächtnisses dieser Komponisten lässt sich ein repräsentatives Bild der mitteldeutschen Musikszene in der Zeit des Barock entwerfen. Leider ist jedoch—mit Ausnahme von Schein und Bach—von dem einstigen Ruhm wenig geblieben, da der Werkbestand im Laufe der Zeit beträchtlich dezimiert und das wenige Erhaltene bisher kaum in Neuausgaben erschlossen wurde. Den hohen Standard der Leipziger Kirchenmusik im 17. Jahrhundert verdeutlichen vielleicht am besten die Kompositionen von Sebastian Knüpfer. Knüpfer wurde 1633 im vogtländischen Asch als Sohn eines Kantors geboren und empfing durch den Vater seine erste musikalische Unterweisung. Im Alter von dreizehn Jahren wurde er in das renommierte Gymnasium Poeticum in Regensburg aufgenommen und verblieb dort acht Jahre. In Regensburg entfaltete Knüpfer eine rege musikalische Tätigkeit, war jedoch ebenso für seine profunden philologischen und poetischen Kenntnisse bekannt. Nach Beendigung seiner Schulzeit ging er nach Leipzig, wohl um dort zu studieren; seltsamerweise taucht sein Name jedoch nicht in der Matrikelliste der Universität auf. Nachweisbar ist in dieser Zeit lediglich sein musikalisches Wirken: Er sang als Concertist in den Aufführungen des Thomaskantors Tobias Michael und gab nebenbei Musikunterricht. Die musikalischen Qualitäten des jungen Knüpfer müssen in Leipzig schon bald aufgefallen sein, denn nach dem Tod von Tobias Michael im Juni 1657 bestimmte man den gerade einmal vierundzwanzig jährigen zu dessen Nachfolger. Die Ernennung Knüpfers zum Thomaskantor erwies sich als eine weise Entscheidung: Durch sein Engagement erlebte die Leipziger Kirchenmusik eine vordem ungekannte Pracht und Grösse. Knüpfers lediglich in handschriftlichen Kopien zirkulierende geistlichen Werke wurden begehrte Sammelobjekte im ganzen deutschen Sprachraum und verbreiteten so den Ruhm des Komponisten und seines Amtes. Nach neunzehn jährigem fruchtbaren Wirken starb er am 10. Oktober 1676 im Alter dreiundvierzig Jahren. Die Zeitgenossen schätzten an Knüpfer besonders seine hohe Gelehrsamkeit, die sich auch in seinen ausdrucksvollen Kompositionen kundtut. In seinen Nachruf heißt es, er habe „Sprüche aus den Psalmen und andern biblischen Büchern mit solcher Lieblichkeit und Kunstfertigkeit komponiert, daß er die betrübtesten Herzen damit aufgerichtet hat und sein Name nicht bloß in Leipzig, sondern auch auswärts mit Bewunderung genannt wird“. Daß es sich bei dieser Würdigung nicht um leere Floskeln handelt, zeigt ein Blick in die Partituren von Knüpfers Vokalkonzerten: Die Kompositionen weisen in der Tat ein ungewöhnlich hohes Maß an kompositorischer Ausarbeitung, musikalischer Erfindungsgabe und einfühlsamer Textausdeutung auf. Vielen von Knüpfers Werken ist überdies eine Würde und Grandezza eigen, die ihren Schöpfer auch aus heutiger Sicht als einen der großartigsten Komponisten seines Zeitalters ausweisen; sie gehören, um mit dem Musikhistoriker Alfred Einstein zu sprechen, zu jenen scheinbar versteinerten Musikdenkmälern, die nur des Meisters und seines Zauberwortes bedürfen, um wieder erweckt zu werden. Das Weihnachtskonzert Vom Himmel hoch, da komm ich her gehört, wie vermutlich sämtliche der großbesetzten Konzerte Knüpfers, zu den Spätwerken des Komponisten; auf der singulär innerhalb der Sammlung Grimma überlieferten Quelle findet sich die wohl als Entstehungsdatum zu interpretierende Jahreszahl 1673. Die Komposition basiert textlich auf einer freien Kombination von Choralzeilen und Spruchtexten und ist als Dialog zwischen dem mit drei Sopranen und drei Violinen besetzten Chor der Engel und dem analog aus je drei tiefen Sing- und Instrumentalstimmen gebildeten Chor der Hirten angelegt; die beiden Ebenen vereinen sich gegen Ende des Werks zu einem abschließenden Dankgesang. Die überweltliche Qualität und unergründliche Schönheit des Engelgesangs symbolisiert Knüpfer durch einen zu den Worten „Ehre sei Gott in der Höhe“ erklingenden strengen Kanon. Die Choralkantate Was mein Gott will, das gescheh allzeit gehört zu den kunstvollsten Werken Knüpfers. Von den vier Strophen der Liedvorlage sind die beiden Rahmenstrophen als musikalisch eng aufeinander bezogene Tuttisätze vertont, während in den beiden Binnenstrophen die Anzahl der Singstimmen von sechs auf drei reduziert ist. Die Choralmelodie erscheint in den Ecksätzen als imitatorisch behandelter cantus firmus, wobei zum Teil äußerst komplexe Kanonbildungen auftreten; in den Mittelteilen hingegen wird der Choral freier behandelt und stärker variiert. Eines des rätselhaftesten unter Knüpfers Namen überlieferten Werke ist die Choralkantate Wenn mein Stündlein vorhanden ist. In seiner musikalischen Substanz geht das Stück weitgehend auf eine Dialogkantate Johann Rosenmüllers zurück, die jedoch—mit Ausnahme der einleitenden Sinfonia und des abschließenden Choralsatzes—in ihrer formalen Gestalt und satztechnischen Faktur stark verändert wurde. Sollte die vorliegende Bearbeitung tatsächlich auf Knüpfer zurückgehen—und die Überlieferung in der Sammlung Grimma läßt hieran kaum einen Zweifel—so ist sie ein wertvoller Beleg für seine Aneignung des berühmten, von Rosenmüller entwickelten harmonisch reichen, überaus klangvollen, ja geradezu sinnlichen Kompositionsstils, der in der mitteldeutschen Musik des mittleren 17. Jahrhunderts eine neue Ära einleitete. Die für die Knüpfersche Tonsprache charakteristische Monumentalität und Erhabenheit zeigt sich besonders deutlich in der großangelegten Psalmvertonung Ach Herr, strafe mich nicht in deinem Zorn. Die Wirkung dieses Werks beruht nicht allein auf der Kombination von hoher satztechnischer Kunstfertigkeit und raffinierter Instrumentationskunst sondern liegt auch in dembewußten Überschreiten traditioneller Gattungsgrenzen. So wählt Knüpfer in diesem wohl um 1670–1675 entstandenen Stück die für die Zeit äußerst ungewöhnliche Tonart c-Moll und verwendet zudem—neben dem obligatorischen fünfstimmigen Streicherensemble—mit den Trompeten und Pauken Instrumente, die man sonst eigentlich nie in dieser Tonart spielen hört. Die ungewöhnliche Klangqualität dieses Werks ist auch durch die beiden Flöten bedingt; welche Instrumente hier genau gemeint sind, ist allerdings nicht völlig eindeutig. Eine in Berlin überlieferte Partiturabschrift bezeichnet diese Partien als „Traversi“, doch ergeben sich hieraus kaum befriedigend zu lösende aufführungspraktische Schwierigkeiten. Ein in Dresden erhaltener Stimmensatz verlangt hingegen „Flauti“ (also Blockflöten), und dieser Anweisung folgt auch die vorliegende Aufnahme. Die Symbolik dieser Instrumente wird im Kontext der Komposition auf seltsame Weise umgedeutet, ja beinahe verzerrt: Der Klang der Flöten steht in diesem Werk nicht (wie sonst) für Sanftheit und Lieblichkeit, sondern symbolisiert stille Demut und schmerzhafte Trauer, und die Trompeten und Pauken demonstrieren nicht den Glanz und die Herrlichkeit Gottes, sondern schildern vielmehr seinen tobenden Zorn und seine grausame Unbarmherzigkeit, die sich erst in der unerwarteten, ins versöhnliche C-Dur gewendeten Schlußkadenz des Werks mildern. Das mit nur einer Baßstimme und einer kleinen Streichergruppe besetzte Konzert Quemadmodum desiderat cervus gehört stilistisch einer früheren Stufe an. Vermutlich entstand es bereits zu Beginn von Knüpfers Leipziger Amtszeit; möglicherweise gehörte es zu einer 1663 für den Druck vorbereiteten Sammlung geistlicher Konzerte, die letztlich aber anscheinend doch nicht veröffentlicht wurde. Das Werk verrät besonders im fließenden Duktus seines abschließenden Tripla-Teils de Einfluß italienischer Vorbilder, namentlich der Musik Giacomo Carissimis. Ein ähnlich dicht gearbeitetes und expressives Werk wie Ach Herr, strafe mich nicht in deinem Zorn liegt in Knüpfers Vertonung des 137. Psalms, Super flumina Babylonis vor. Der düstere Text erhält seine große Intensität durch die das vierstimmige Vokalensemble begleitenden Zinken und Posaunen. Ein maßgeblicher Zug der klanglichen Gestaltung ist der Umstand, daß die Bläser lediglich in den Tuttiabschnitten zum Einsatz kommen, während die solistisch vorgetragenen Binnenverse sowie die kurzen Ritornelle allein der fünfstimmigen Streichergruppe vorbehalten sind. Die melancholische Stimmung des Beginns steigert sich in der abschließenden, als Fugato gesetzten Verfluchung Babylons zum unerbittlichen Zorn. Die mit fünf Singstimmen und fünf Instrumenten besetzte Choralkantate Jesus Christus, unser Heiland basiert auf einer Dichtung Martin Luthers, während die zugehörige Melodie noch aus vorreformatorischer Zeit stammt. Knüpfer kombiniert hier die dreistrophige Anlage seines Texts mit einer kunstvoll symmetrisch gestalteten musikalischen Struktur. Die beiden Rahmensätze erklingen jeweils im Tutti mit einer zeilenweise imitatorischen Behandlung der Choralmelodie; der dritte Vers ist dabei eine in den Dreiertakt versetzte Variante des ersten. Der konzerthaft aufgelockerte Binnenvers wird durch ein tänzerisches Ritornell eingerahmt. Das Pfingstkonzert Die Turteltaube lässt sich hören entstand für eine Aufführung im Mai 1676, also wenige Monate vor dem Tod des Komponisten; es gehört somit zu seinen letzten Werken. Die trotz der gewaltigen Besetzung, die vier Trompeten einschließt, ausgesprochen liebliche Stimmung der Komposition zeigt, wie Knüpfer die von Rosenmüller und verschiedenen italienischen Vorbildern ausgehenden Anregungen aufgriff und in seinen eigenen Stil zu integrieren vermochte, ohne etwas von der ihm eigenen strengen Monumentalität aufzugeben. Der Text des Werks ist in dialogischer Form aus verschiedenen Bibelstellen zusammengesetzt und wird in weiten Passagen solistisch vorgetragen. Auf diese Weise spart der Komponist die volle Pracht des Tutti geschickt für die abschließende Lobpreisung der heiligen Dreifaltigkeit auf. Little of Knüpfer’s music has previously been transcribed from its many manuscripts, let alone published. The realization of this project brought together the skills and knowledge of many people. Thanks are especially due to Dr Karl-Wilhelm Geck at the Saxon State Library in Dresden, to the music librarians at the University of Uppsala and the Berlin State Library, but most of all to the patience and extraordinary transcriptive skills of Brian Clark, without whom this project could never have happened. Von den vielen Manuskripten Knüpfers sind bisher nur wenige transkribiert, geschweige denn herausgegeben worden. Um dieses Projekt zu ermöglichen bedurfte es des Wissens und der Fähigkeiten vieler. Besonderer Dank geht an Dr Karl-Wilhelm Geck von der Sächsischen Staatsbibliothek Dresden, an die Musikbibliothekare der Universität Uppsala und der Berliner Staatsbibliothek, vor allen aber an Brian Clark, ohne dessen Geduld und außergewöhnlicher Fähigkeit Notenmanuskripte zu transkribieren dieses Projekt niemals realisierbar gewesen wäre.